What is a layer attachment/metadata? The four-character code of each attachment, as well as its size and description are shown. You can import, export or delete any attachment. You can also view some types, such as mark-ups. While the size of attachments is not limited, there is a maximum number of attachments allowed per layer. 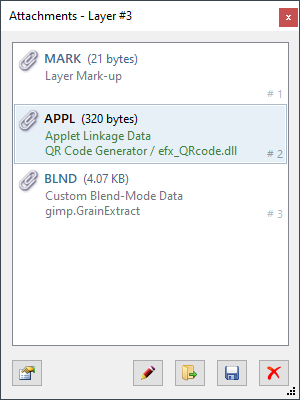 Also note that there are controls on the allowed types and usage of metadata as outlined in the SDK under Layer Attachments. The use of very large attachments (in excess of 64KB) is allowed but discouraged because doing so can significantly increase memory usage and disk-space consumption.